Mackinac Island Michigan hiking trails take you around the island or up through the island. There are over 140 miles of roads and trails on this small island that’s only 8.2 miles around. Many of the trails are designated for foot traffic only although you will see occasional horseback riders and mountain bikes on them. Even though there are no automobiles allowed on Mackinac Island there are many trails that are paved roads that are shared by people, horse drawn carriages and bicyclists. So, be aware in what's coming up behind you while walking! One of the longest hiking trails is the “Round the Shore” hike that’s on a paved road and has spectacular Straits of Mackinac views. Most people take this trail by bicycle but it’s nice as a hike too. This is an 8.2 mile hike. 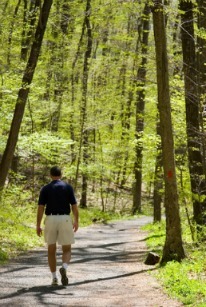 To read about 7 terrific walking, biking or hiking tours click here to get the details about them! Other popular walks are inland that will take you through the forest with some steep climbs up to Fort Holmes that has spectacular views and is a quiet spot for a picnic. Many of the hikes are fantastic for families with young children. Make sure you take water and maybe a snack to eat for the only place to stop is at the historic British Landing locale where the Cannonball Snack Stand is located. The Cannonball is famous for its yummy fried pickles and other great sandwiches, ice cream and drinks. It is located just about halfway around the island. There are also public restrooms at this stop. If you are tired of going around the island on the shore road or if you are tired hiking on dirt trails this is where you can change your course easily! 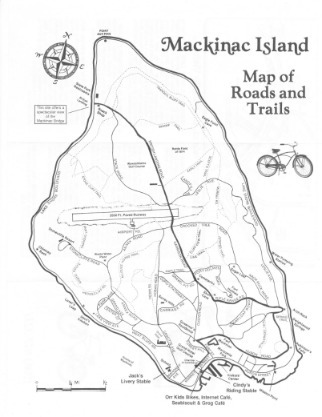 For a detailed map of Mackinac Island Michigan hiking trails stop at the Visitor’s Center which is just across from Marquette Park right between the marina and the Chippewa Hotel on Main Street. There are public restrooms at the Visitor's Center too. To learn more about all the wonderful Mackinac State Park sights to see while on your Mackinac Island Michigan hiking trails adventure click here. 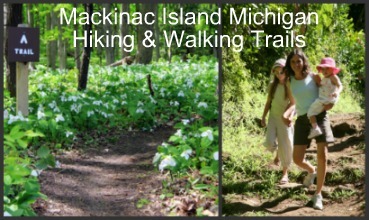 Insider Tip: Another popular hiking trail especially for families is at Mill Creek State Historic Park in Mackinaw City. The trail is around 1.5 miles but what’s especially nice there is a one mile loop portion of the nature trail that is handicap accessible! This State Park is located on over 600 acres with absolute beautiful forest, wildflowers and scenic views of the Straits of Mackinaw. And your older children and maybe even yourself will love the zip-line! Return to “Mackinac Island Vacation Home Page” from "Mackinac Island Michigan Hiking Trails"